"If You Only Knew "is a beautiful and captivating novel about two women that come together across generations and their struggle to take control of their destinies. When Elin one day finds an engagement ring in her boyfriend Zach's pocket, she panicks. She packs a bag and goes head over heals to Hallands Väderö a place she swore never to return to. She gets to share the lighthouse keeper’s house with Anja, an elderly lady who has come to the island to paint. They are both plagued by painful memories of the past and does not enjoy the presence of anyone else. After a rainy night in a field together with cows the two women splits the walls they spent such a long time to build up. Together this summer on the Island everything changes. Surrounded by the dramatic landscape a deep friendship grows. The security they feel in each other's company gives them the courage to look inside and open the doors that have been locked, suddenly one’s question is the other one’s answer. 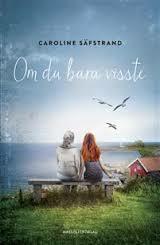 “Caroline Säfstrand has written a heartwarming novel that stays in your mind a long time after its read. She has a reliable voice of her own, it has resemblance to novelists like Kerstin Thorvall, Elsie Johansson and Therese Söderlind. " " If you only knew is a Swedish summer caramel. "